Seminar paper from the year 2009 in the subject Philosophy - Practical (Ethics, Aesthetics, Culture, Nature, Right, ...), University of Manchester (Political Theory), language: English, abstract: The structure of the text is as follows: I shall first give a very brief account of what it means to have a right, based on the Hohfeldian view, in order to understand the common framework upon which most modern rights-theory is founded. I will then move on to explain the rationales of the use of either choice theory or interest theory in the explanation of rights. 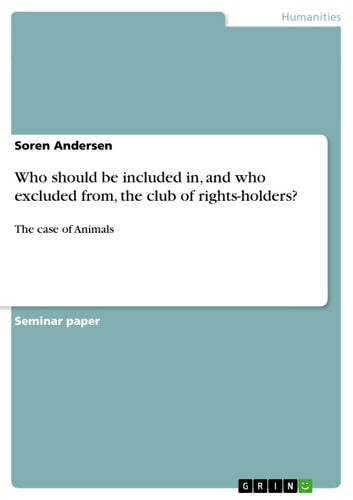 This short theoretical introduction will serve as a base for the actual question of whether animals should belong in the category of rights holders. 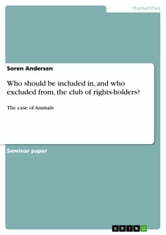 2 Determining Rights-holdersThe Case of Animals In this section I will present some of the views of the aforementioned authors and critically assess and reflect on them. Ähnliche Bücher wie Who should be included in, and who excluded from, the club of rights-holders? Is Time Universal? Discuss whether the anthropological evidence tends to support or refute the idea that there are human cognitive universals. What does a suicide rate reveal about a society?